How long will they last outside a humidor? How long will they last inside a humidor? Once they’re inside the humidor, do I need to do anything else? Can you age cigars, like you would a bottle of wine? Cigars have a reputation for being somewhat delicate. They need to be stored at a very specific temperature and humidity level. They even need to be protected from pests like tobacco beetles using Spanish cedar. But once they’re safely stored, cigars are surprisingly long lasting. Without a humidor, cigars start to decay and lose their freshness fairly quickly. Depending on the temperature and average humidity level where you live, most cigars will start to decline after one month of storage outside a humidor. If you have a cigar collection but don’t yet have a humidor, you can temporarily store your cigars in a Tupperware container. Add a very lightly dampened paper towel (make sure it doesn’t touch the cigars directly) to act as a makeshift humidifier if you don’t have a humidity pack. This is a temporary solution that we don’t recommend using for longer than a month. 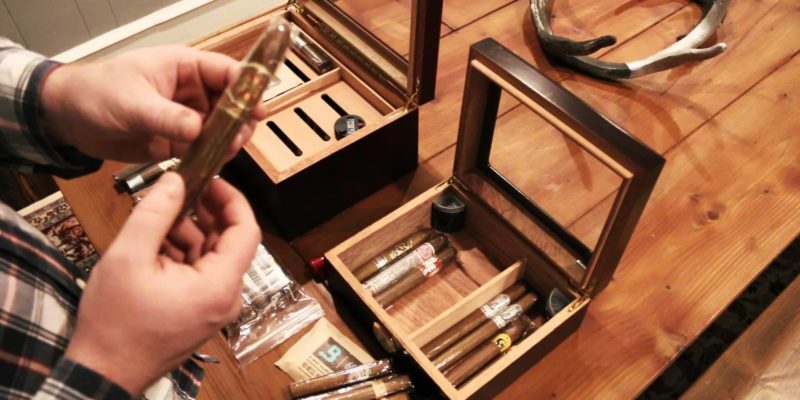 If you have a growing cigar collection, you need a humidor for safe long-term storage. Cigar humidors maintain a stable humidity level, protecting your cigars from natural fluctuations in humidity and temperature that occur in the “real world.” If you set up your humidor correctly, it should keep your cigars in smokeable condition for up to five years. It’s important to remember that the longevity of your cigars depends on your humidor being set up properly. If you don’t properly season your humidor, or you forget to calibrate the hygrometer and set it to the wrong humidity level, there’s a serious risk of your cigars deteriorating early. Our guide to storing cigars in a humidor explains how to set up your humidor for simple, lasting cigar storage. Once the cigars are in the humidor, do you need to do anything? Despite their reputation for being delicate, difficult-to-store items, cigars require very little in the way of maintenance once they’re stored in a humidor. Cigars are affected by their environment, and there’s a real chance of one cigar picking up scent and flavor characteristics from other cigars over time. This is especially true if you store several different types of cigars in your humidor at the same time without using dividers. To prevent your cigars from imparting their flavor onto each other, use dividers and sort different types of cigars in different parts of your humidor. If you buy your cigars in boxes, store the whole box inside the humidor and make sure the boxes stay closed to retain the scent and flavor. Because your cigars need to be kept at a consistent humidity level, it’s very important to check that your hygrometer gives an accurate reading. Every three months, remove the hygrometer from your humidor and calibrate it using the towel or salt methods. You can find a quick and simple guide to the towel hygrometer calibration method in our guide to storing cigars in a humidor. If your humidor has a built-in ventilator, there’s no need to aerate it. If it doesn’t, make sure you open your cigar humidor every couple weeks to provide a source of fresh air for the cigars. Because cigars are made from natural materials, they “breathe” over time using the surrounding oxygen. To aerate your humidor, open the lid and keep it open for one to two minutes. This is more than enough time for fresh air to get into the humidor. Once you close the lid, it will take a few hours for the humidor to return to its previous humidity level. Yes. Cigars, like wine, can develop a better flavor profile with age. Most cigar enthusiasts think that cigars develop their best flavors after about five years of storage, although some cigars will taste best after 12-24 months in a properly calibrated humidor. Because every type of cigar is different, there’s no “rule” for aging cigars. If you’re interested in aging your cigars for a better flavor, ask your local cigar store for advice on how long to store a certain cigar brand and type, then label the box before storing it inside your humidor.